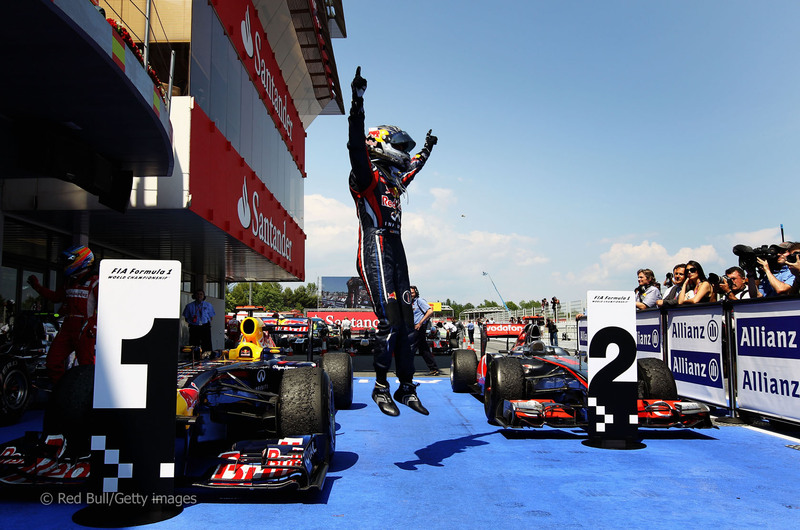 SPANISH GP REVIEW ’11 – ATTABOY SEB! 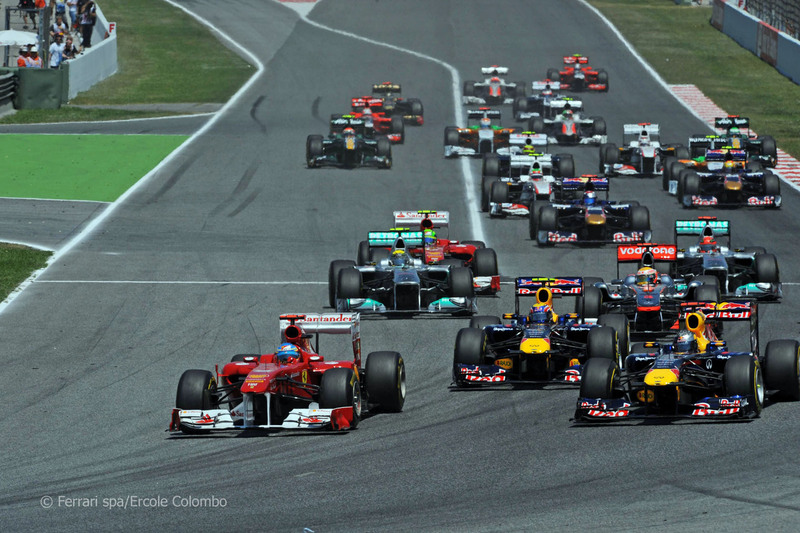 With the Spanish GP of Barcelona, the European F1 season is properly underway. The GP has been somewhat dreaded by the fans as the track is as boring as they come with practically no overtaking. So with the longest DRS zone yet and the Pirelli tires in the mix, it would be exciting to see if we would finally see some proper passing here. Would Vettel make it 5 out of 5 poles here? It sure seemed like it when he had a tech problem in the last practice session and even with only enough time for one timed laps he goes out and sets a blinder of a lap to go quickest in FP3. The boy sure knows how to reel off a one-lapper when needed. Qualifying didnt go exactly to plan for Vettel though. After getting the fastest time in Q2 with Webber 2 tenths behind and Hamilton trailing 6 tenths, Webber does a fantastic lap in Q3 – 1.20.9. 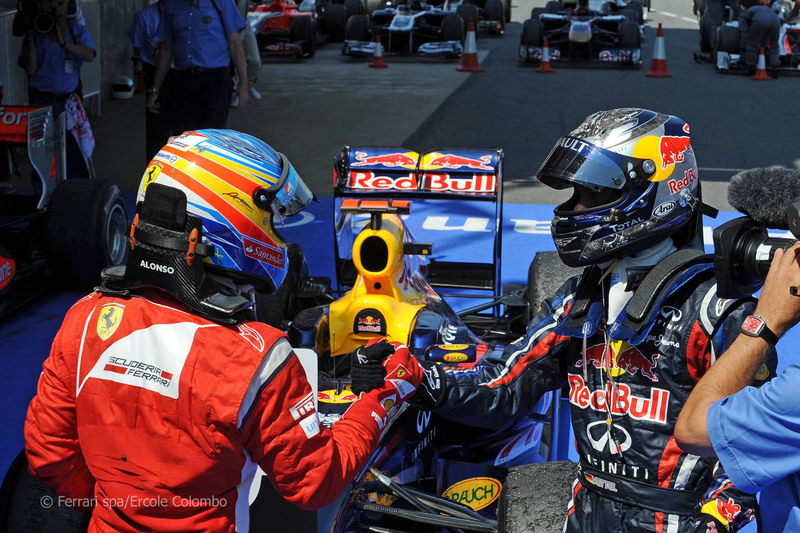 With Vettel on a fast lap after Webber, everyone expected him to beat the Aussie to the pole. But the sector times were very similar in S1 and S2. 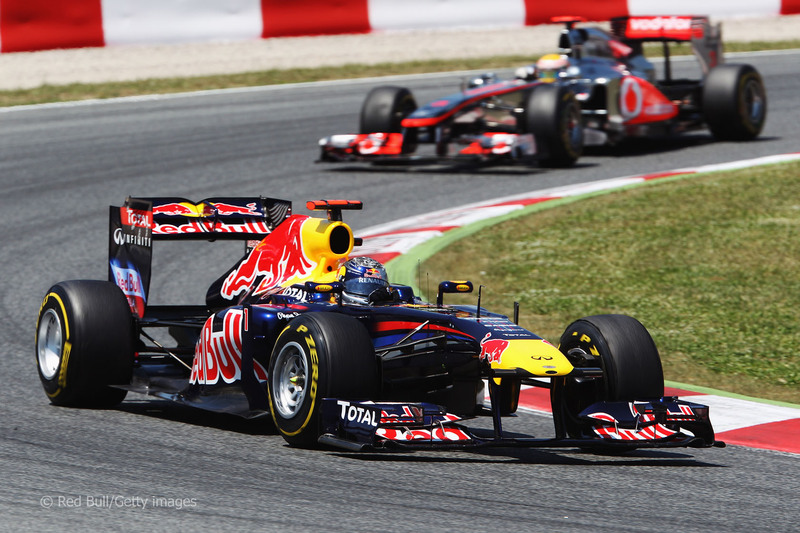 Losing a surprising amount of time in S3, he sets a laptime of 1.21.1 – 2 tenths slower than Webber. It later became clear that his KERS was not working at all while Webbers was. That explained the lack of pace in S3 where all the drivers use KERS in the final corner to slingshot them onto the straight. As well in a couple of other places on the lap. So the KERS ghost is still haunting the Red Bull team. Fernando Alonso somehow manages 4th place on the grid by squeezing in between the McLarens in front of Button. Great lap from the Spaniard. Almost a second quicker than his teammate Luca Badoer.. I mean Massa.. The lights go on one by one. “Look, but never stare” (at the lights) as Mr. Brundle on the BBC so brilliantly puts it. Lights out and one man that clearly didnt stare was Fernando Alonso, who was lightning quick off the start! From fourth place he takes advantage of Mark Webbers hopeless attempt of blocking his teammate and takes the lead. One almost suspects another jump start but it appeared to be clean. Who saw that coming? The roar of the Spanish fans drowns out the scream of the engines for a moment and the air is electric with excitement. Can Alonso keep his pursuers behind? Yes, he does – even when the DRS is enabled, Vettel is unable to close the gap. Was the DRS zone made too short here? Even if it was the longest so far. Vettel pits on lap 10. Probably to try and get some clean air to perhaps be able to jump Alonso in the pits. But what is this? He finds himself behind the Schumacher train of Schumacher, Rosberg, Massa and Button. Not good at all. But what follows is some of the finest driving I have ever seen Vettel do. Instead of getting down over his predicament, he is determined to get out of the situation as quickly as possible. He has new tires, yes, but the track has proven very hard to pass on – even with DRS. But he dives on the inside of Button at turn 5 and sticks the pass. Only a few corners later he puts the move on Massa at turn 10 and disposes of him. Schumacher dives into the pits and down the straight he gets close to Rosberg, uses the DRS and passes him. Schumacher train disposed of in one lap. Easy peasy, lemon squeezy. Vettel did lose enough time for Alonso to get out ahead of him after his pitstop. But now he is right behind him again instead of having Alonso go off in the distance while he is caught in traffic. Nicely done. And there will be other chances. Crucially he also is ahead of Webber who pitted together with Alonso. Webber on the other hand loses 3rd place to Hamilton in the pit stops. Fast forward to Vettels second pitstop on lap 18. There is no way past Alonso and this has allowed Hamilton to close right up on his tail. So the Red Bull team decides on an early pitstop – probably a couple of laps earlier than planned. This to try and get the jump on the Ferrari. Ferrari tries to cover this by pitting the very next lap but to no avail. Without any traffic to speak of this time, Vettel sets a very quick lap time and jumps the Ferrari to the dismay of the Spanish fans. A few laps later it only gets worse for the Spanish fans when their favorite driver, Hamilton pits and also gets the jump on Alonso and slots in behind Vettel in second place. With things looking their familiar self with Vettel in front, most were expecting Vettel to up the pace and get a comfortable gap to whoever is in second place and control the race from there. No so this time. It seemed so at first but a very hungry Hamilton with an upgraded McLaren in his hands actually starts to close the gap to the young German. Lap by lap he starts reeling him in. How is this possible when the Red Bull was so much faster in qualifying? One of the reasons emerges over the team radio as Vettel is told not to discharge (use) his KERS. Again with the KERS problems? It is an Achilles heel to the Red Bull. Meanwhile, I want to mention Button who had a horrible start from 5th to 10th. He has now clawed himself back into 5th position and looks set to make one less stop than the leaders. Doing so seems very brave after trying the same in Turkey and failing. Could he really get the jump on both Alonso and Webber ahead of him? Speaking of them, Webber and Alonso is in a mighty battle in 3rd and 4th. The Spaniard is not an easy man to pass and it doesnt help the situation for Webber that they both pit on lap 29 and emerge out in the same position. In fact Button catches up with Webber and passes him with a great move at turn 1. A lap later he passes Alonso for 3rd place. Fresh option tires obviously played their part but this is what strategy is all about. Alonso pits a 4th time already on lap 39 meaning he has 26 laps to go on the hard tire which is a tall order. Webber stays out 8 more laps and jumps Alonso easily as the Ferrari struggles for pace on the harder tire. To add insult to injury, Alonso is actually lapped by the Red Bulls and McLarens in the end. And who saw that coming after he initially lead the race? The updates Ferrari brought to Barcelona not working out for them at all. On top of that Massa spins and eventually retires from the race. The kid is something else. What a race. The stage is set for a showdown between the Bulls and the Silver Moose. The race pace shown today must be worrying for the Red Bull team. So many more things going on in the race worth a mention. But I have to focus on the leaders for time and space. But Perez had a good race. Kobayashi recovers well after his first lap puncture and brings home a point. Heidfeld from the back to 8th. Schumacher beating Rosberg must be a nice feeling for him after a disastrous last race. All in all Im loving this new age of F1. Only a week to Monaco. Lets go! The reason why Vettel is the driver of the day is simple. The Red Bull with KERS working on and off was simply not the fastest car today. But he made some awesome passes when he needed to and got the lead. He held off a charging McLaren. Something his teammate was unable to do as he succumbed to Button. He didnt start from pole and yet won. Something that has not been done on the Catalunya track in 10 years. Had this situation played out in Turkey then Hamilton would have won. 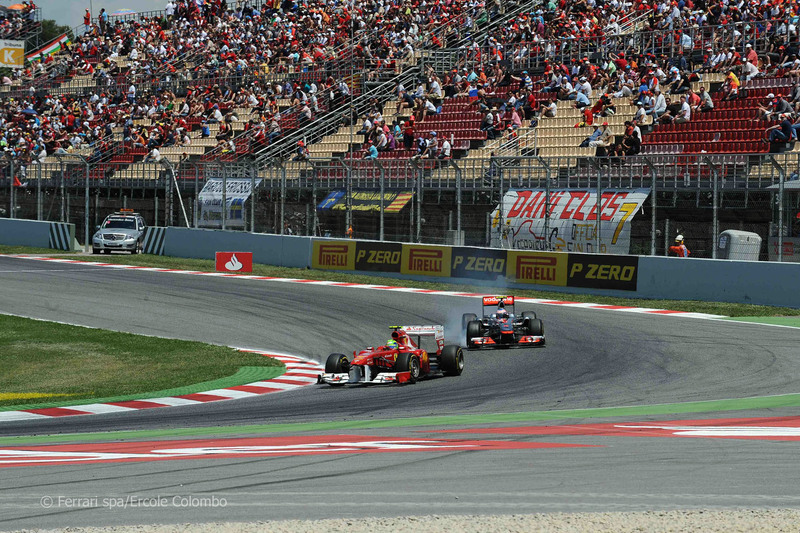 But Sebastian used the weakness of the Barcelona track to his advantage. To be chased down like this lap after lap is unbelievably stressful. He did not crack by going wide or making some sort of mistake. This shows great maturity. So I can only say well done to Sebastian Vettel. A good second are the McLaren drivers. Hamilton was on fire and drove to the maximum every lap chasing that win. Button once again shows what a smooth driver he is by making that 3 stop strategy work and recovering from 10th to a podium. Douche might be a bit strong here but this was Webbers opportunity to show his stuff from pole and he botched it. He not only lost the lead but finished 48 seconds behind the leaders and this is a track he likes. The Pirelli tires doesn’t seem to be his best friend, so I don’t see him stepping up to Vettel any time soon. I know I gave a 10 the last time in Turkey but I simply have to do it again. I was entertained from start to finish. I was at the edge of my seat watching the Vettel-Hamilton battle unfold. This was what the Turkey race didnt have – a real fight for the win. China had it and Hamilton came out victorious. 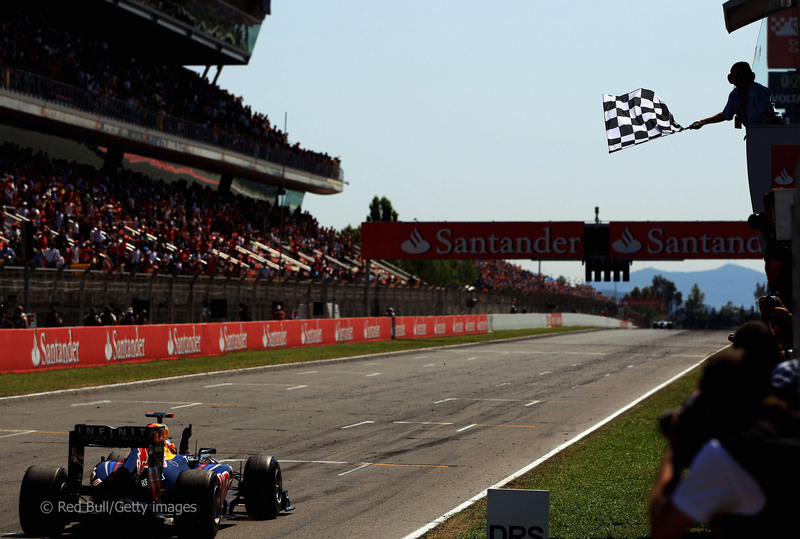 This time Vettel held his own in one of his finest hours. Cant wait for Monaco!